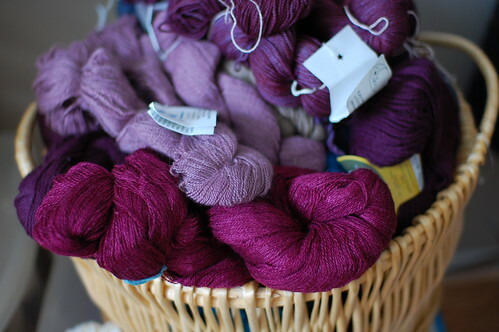 …your regularly scheduled Rhinebeck yarn post for an important announcement. Make them NOW. Go to the store for ingredients if you must – they are orange and black after all, perfect for that Hallowe’en party later this week (if they make it to then). My very slight mods to the recipe: I used 1/2 brown, 1/2 white sugar, upped the chocolate chips a touch (to use up the rest of the bag), mixed by hand, and used heaping tablespoons rather than 1/4 cup portions for each cookie. I got 30 cookies…but there aren’t that many now! A sneak peek at the yarn? Sure. Clearly I’m in a purple period! Oh those cookies look so good! Om nom nom. Those cookies look seriously fantastic. 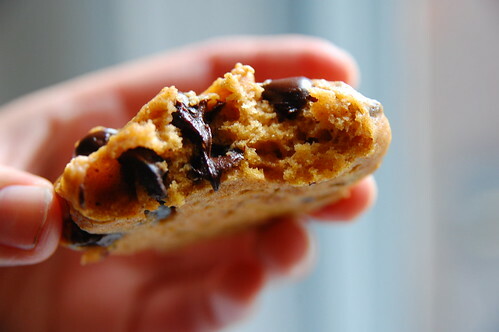 Definitely more appetizing than the cookies on the recipe page! I just bought a can of pumpkin puree to experiment with but you saved me the trouble. Cookies, here I come! Thanks! 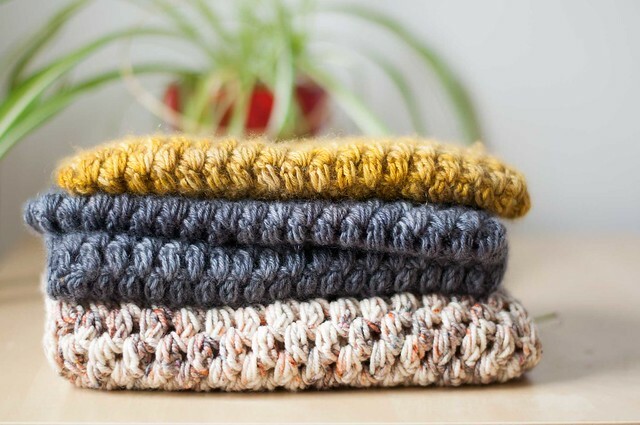 And, as always, thanks for all the fantastic yarn and knitting photos! What a perfect post! I fully intend to make many pumpkin treats on Friday after work and this recipe would be wonderful to try out. It was a pleasure meeting you at Rhinebeck (I told you I stalk your blog, didn’t give my name and didn’t say much else)and I can’t wait to start on my second pair of socks with some help from your book. Thanks for posting this recipe!! I’ve got three huge cans of pumpkin from Sam’s Club to use up and I can only take so much pumpkin bread. I have to say, these do go quite amazingly with Silk Nog. 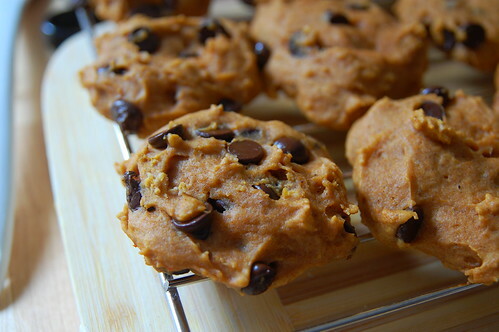 OMG, I need these….and I have pumpkin….and choc chips, YESSSSSSSS!!!! Blog reading IS torture ;-) Which one do I want the most: cookies or yarn? Yum!!! Thanks for the recipe! Yum! Thank you for sharing. I love pumpkin. Oh mann, thank you for reminding me that pumpkin and chocolate is a really good baking decision. I know what I’ll be doing this weekend. Wow. I don’t have anything more pressing to do Saturday morning, so I think I’ll have to add a grocery shopping trip to the list. Last night’s baking put me firmly in no more sugar land. I made these yesterday after reading your post! Yummy! I did 50-50 sugar-brown sugar like you did because the other really successful cookies I make use brown sugar too – so i thought there must be something to that. I also used mini chocolate chips and a tsp. size scooper to drop them on the cookies sheets! These will make a perfect hostess gift this November for (American) Thanksgiving! Thank you so much!